Our power catamarans have quickly become our #2 yacht style within the fleet with their modern amenities, ideal layouts, ease of mobility, plus affordable power yacht pricing when compared to traditional motor yachts. Modern amenities: These newer additions to the fleet feature modern amenities, luxurious appointments, spacious and well designed layouts, plus the oh-so popular fly-bridge decks. Greater mobility: Power Cats offer quick and easy mobility through the islands, and as they're smaller and more agile than the traditional, plus-expenses motor yachts, our power catamarans gain access into the smaller and more off the beaten path anchorages. Superb stability: These yachts offer wide, stable platforms plus superb stability while underway and at anchor, making them ideally suited to first time charterers, groups of couples or family charters. More-affordable power yacht pricing: Clients can enjoy the best of both worlds, including the luxury and mobility of traditional motor yachts, but aboard newer and more agile yachts that generally fall within our mid-range luxury to high-end exclusive price points of $25,000 to $65,000 all in, excluding crew gratuity. 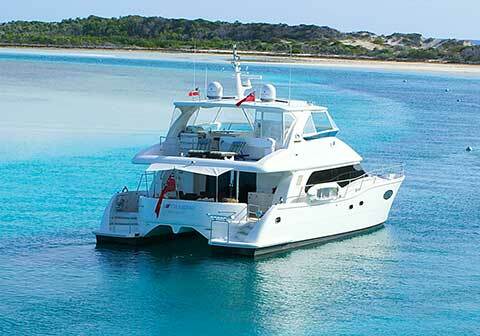 What Do Power Catamaran and Motor Yacht Charters Cost? The majority of our power catamarans fall in our mid-range luxury to high-end exclusive price points of $25,000 to $65,000 all in, excluding crew gratuity. While many of our power catamarans are plus expenses and typically at 35% on top of the weekly published rate, they still fall within these more affordable price points when compared with traditional motor yachts. Browse our power catamarans and motor yachts below or learn more about our highly popular catamaran options. If you have questions or are ready to book your charter, call us in our South Florida office at 954-980-9281, Toll Free at 888-670-6884, or complete our Quick Request Form. Hi Lynne, Great trip! Ultra is awesome. Let me know if you have some time to chat next week - thinking about buying a boat for charter - would love to get your advice! Thanks again for all your help!!!! To sort power catamarans, click on Size, Max Guests, Low Price or High Price at the top of the table. To sort motor yachts, click on Size, Max Guests, Low Price or High Price at the top of the table.